The SVOD giant is making One Animation's long-form series available in global territories, after the brand's shorts have garnered nearly two billion views across social media. 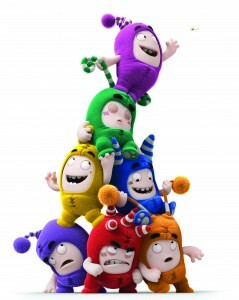 One Animation’s long-form animated TV series Oddbods has bowed on Netflix in North America, Latin America, Europe, the Middle East, Africa, Australia and New Zealand. The SVOD deal comes as Oddbods‘ one- and five-minute shorts have garnered nearly two billion views across social media. The show’s second season will also stream on Netflix later this summer. The 60 x seven-minute toon follows seven colorful characters as they play pranks on one another. The series’ long-form version sold last year to broadcasters including Boomerang, Disney channels in Asia, Canal Plus in France and Africa, ITV in the UK and Boing in Italy. This past fall, ITV also signed on licensees for Oddbods with help from UK master toy partner Golden Bear.